These are listed as 0.452 diam but I get 0.453. Could be my inaccuracy. Few bullets have bases that are really, truly round. Cast lead ones tend to vary the most, so it's best to make several OD measurements across different diameters around the bullet and average the high and low readings. And many bullets will have different OD's at the front and rear of the body - if you look and measure close enough. A single OD measurement can be very misleading. Last edited by niemi24s; 19th March 2013 at 09:34. It would be useful if Post #16 could be edited to show this image because it's referred to several times throughout this thread. Missouri Bullet Co. 200gr. SWC "Bullseye #1"
Thanks for the new info Doc. We didn't have the Berry's #00337. If you have the time, see if you can give us the body length measurement using the method shown in Post #103. Without knowing the body length, the data isn't of much use to the handloader because without it you can't calculate the nose length And without the nose length you can't calculate a minimum COAL as shown in Post #103. We started this thread because many bullet manufacturers provide useless data for the cartridge overall length - they cop out by either giving the maximum SAAMI length or some other equally useless advice. Ok, I think I understand what is needed. I took 5 random bullets and marked each about 180 degrees apart with a Sharpie. Marks were scraped with a razor and two measurements were taken from each bullet. These ranged from a minimum of 0.301 to 0.322 for an average of 0.314. This is what I believe you are referring to as the body length of the Berry's #00037. If I'm doing the math right, the OAL-the body length=the nose length, which would give about 0.560-0.314=0.246 for nose length. Nose length plus case length would equal cartridge OAL. Please correct me if this is not correct. Thanks Doc. You've got it correct. 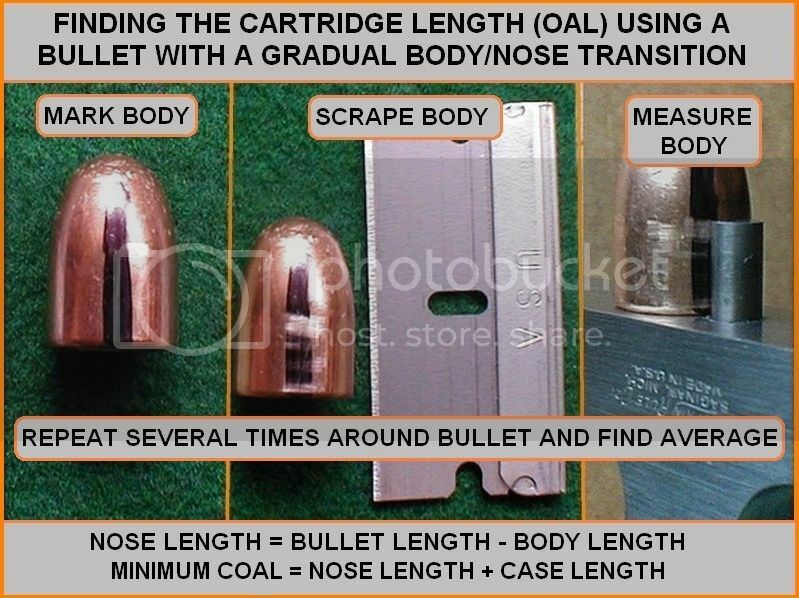 The only "trick" in this process is in the scraping: some effort must be made to insure the razor blade stays in firm contact with the back end of the bullet (so as not to scrape anything off the nose section of the bullet). Another method that I've used involves doing the scraping by holding the bullet on a piece of flat stock and pulling the bullet toward me while rotating it slightly with most of the downward pressure applied at the back end of the bullet. But the variation you found is pretty normal for a plated bullet because thy get dented a lot during the plating process as they're tumbled in the plating solution. Anyway, thanks to your body length measurement the minimum COAL would be about 0.895 + 0.246 = 1.141" and is simply based on the idea that none of the sub-caliber nose section of the bullet should be seated below the case mouth. But as far as the maximum COAL goes, you could probably use the SAAMI max or maybe even longer - as long as it fits in the magazine and the gun feeds it OK.
Last edited by niemi24s; 12th February 2019 at 22:26. Picked up some new bullets to try and didn’t know if you have the info on these or not. Thought it would be somewhat easier to make the measurements vs. reading all the posts, sorry. Thanx, didn't have that one. And there's no need to go through all the posts to see what's already been reported. Just open up the spreadsheet link found at the bottom of Post #1 and you'll find them all in one handy place.